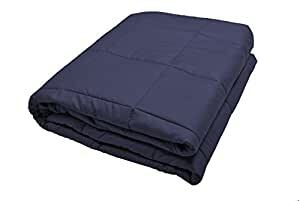 Comfortable and soft, 100% cotton weighted blanket for adults. It is a weighted blanket without removable cover. The weight is distributed evenly throughout the blanket and made up of non-toxic poly pellets. Hand wash or delicate cycle and dry flat. Or you can add cover Easy to spot clean. A great gift for you and your loved ones. The heavy blanket helps relax the nervous system by simulating the feeling of being held or hugged and make you fall asleep fast and sleep better. Zonli weighted blanket will help you fall asleep faster and sleep better,Itâs really a perfect gift.